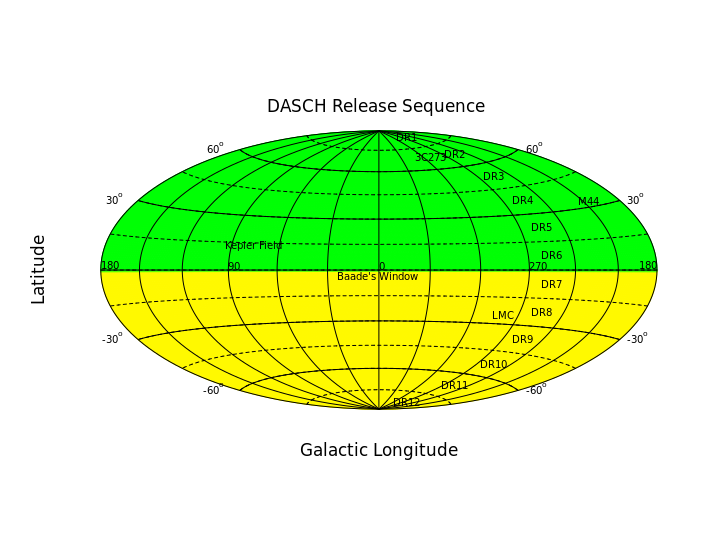 The Digital Access to a Sky Century @ Harvard (DASCH) project is pleased to release its sixth production data release (DR6), covering Galactic latitude b = +0 to +15 deg, joining results from DR1, which includes the 5 Development Fields from which the hardware and software pipelines for DASCH were developed; and DR2 through DR5. These represent ~36% of the Harvard plate data (1885 - 1992; full-sky excluding spectra and rejected plates). 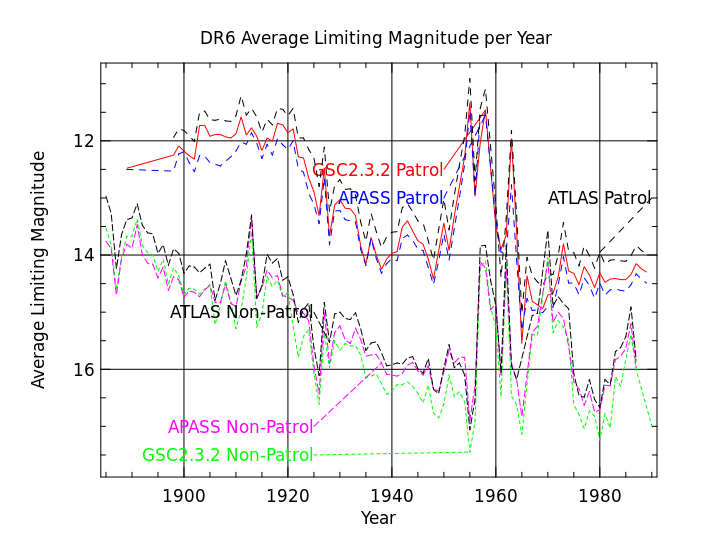 A brief overview of DASCH is given in Grindlay et al (2012) Opening the 100-Year Window for Time Domain Astronomy in arXiv:1211.1051 or IAU Symposium Vol. 285 p 29-34 . Additional project papers are listed in the DASCH publications web page. Digitized images (11 micron pixels) of ~166,000 plates and their fully reduced WCS solutions and SExtractor-based photometry of every resolved object are available from this Data Release from the ~196Tb of data on disk now available. Light curves (LCs) typically include 1500 points for an object with magnitude B ~12-13. LCs may be retrieved from input coordinates or SIMBAD object names for up to 10 at a time, and LC plots, data and images for each then downloaded individually. We plan to release additional 15deg increments in decreasing galactic latitude. We revised plans for subsequent releases to continue through the plane of the Milky Way to the South Galactic Pole, completing the project by September, 2020. This revision avoids an originally planned skip from galactic latitude 15 to the South Galactic Pole working back towards the plane of the Milky Way. The maps at the left illustrate this release strategy in galactic and equatorial coordinates: green indicates released areas and yellow indicates areas currently being scanned. 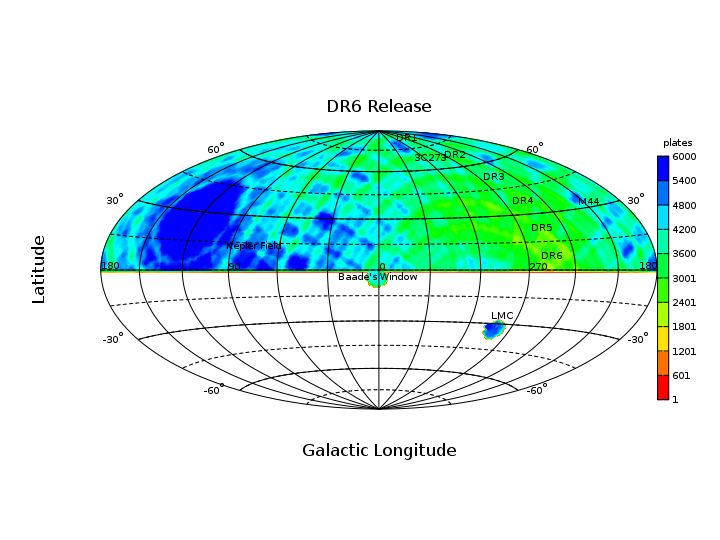 The following tables show the extent of released sky regions and the number of plates currently assigned to each region. Because many plates span multiple release regions, each plate is assigned to the release region which covers the most area on the plate. These numbers can not be final until we have completed both the logbook transcription process and full astrometric processing for all of the plates. We are currently releasing regions when we have scanned over 80% of plates currently estimated to have their plate centers in the new release region. The Development Fields are listed in the Table below and are centered on the coordinates given. Since adjacent fields have not yet been scanned, they are increasingly incomplete with increasing radius. The 3C273 field has been integrated into DR2 and DR3; the M44 field has been integrated into DR4 and DR5; and the Kepler field has been integrated into DR5 and DR6. Additional fields will be integrated into the Production scanning as they are covered in the data release plan described above. The counts of plates do not add up to the total plates in the release because many plates cover portions of multiple release regions. 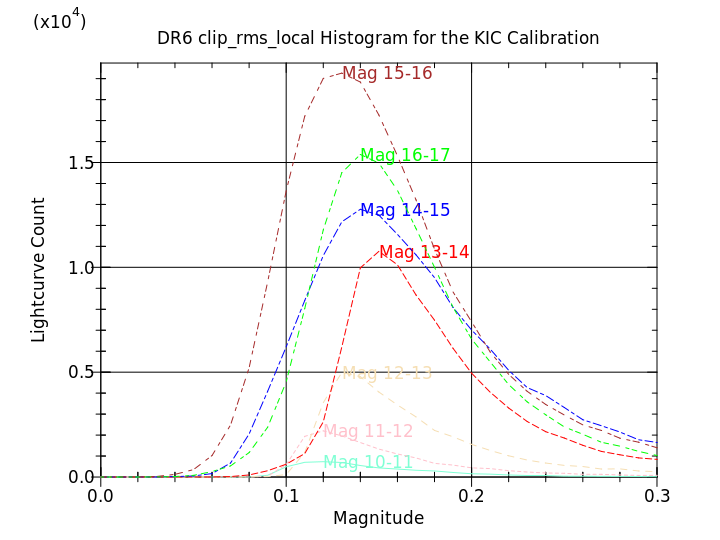 An overview of plate processing and image magnitude calibration appears on the DASCH Photometry Results page. For each plate, the pipeline generates three sets of magnitude measurements, one for each of three calibration catalogs. 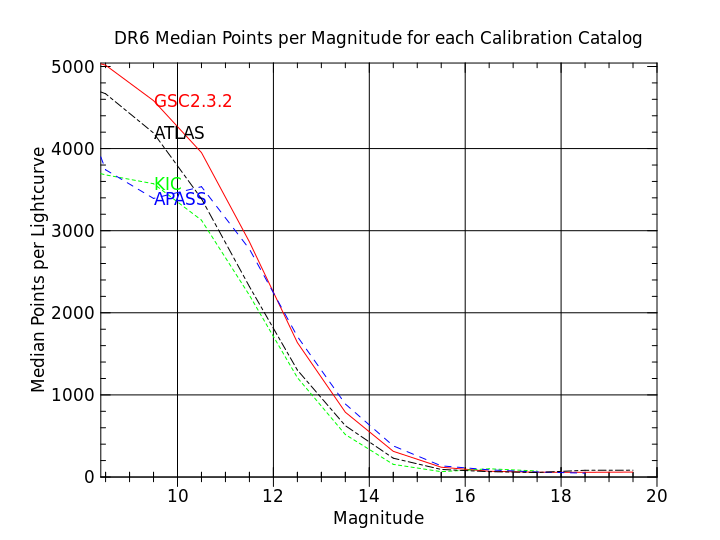 The GSC2.3.2 calibration catalog provides the broadest magnitude coverage but with limited accuracy. The Kepler Input Catalog provides more accurate magnitude and color measurements, but for a limited region of the sky. 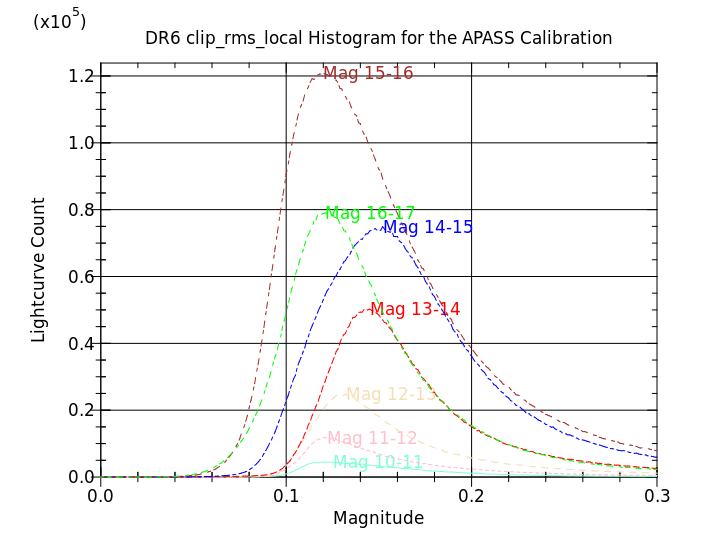 Finally, the APASS DR8 catalog provides good photometry accuracy, but is limited in magnitude range and is not yet complete in all regions of the sky. 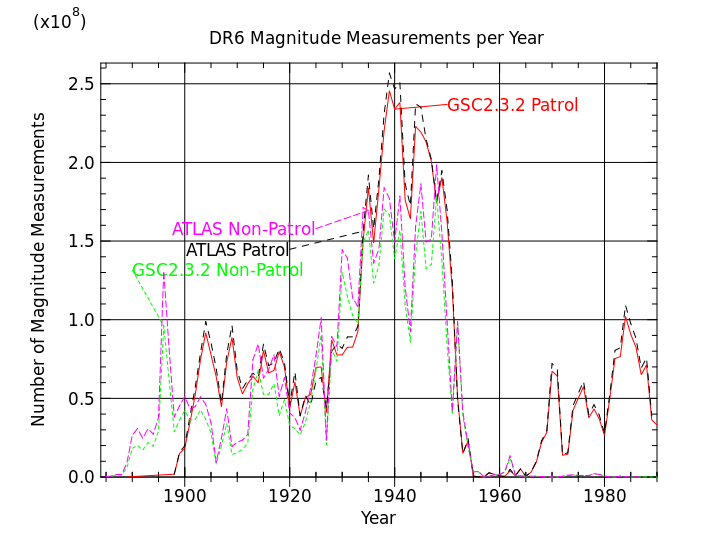 The leftmost plot show that the released data contains over 11,236,000,000 GSC2.3.2 calibrated magnitude estimates spanning the years 1885 to 1989. The data comes from 36 telescopes which may be divided into 23 wide field patrol telescopes with scales greater than 350 arcsec/mm and objective diameters of 1 to 3 inches; and 13 narrow field telescopes with objective diameters of 4 to 24 inches. The main patrol programs ran from about 1900 to the 1950's. A smaller patrol program using six Damon telescopes with 1.65" diameter objectives ran from 1970 to 1990. 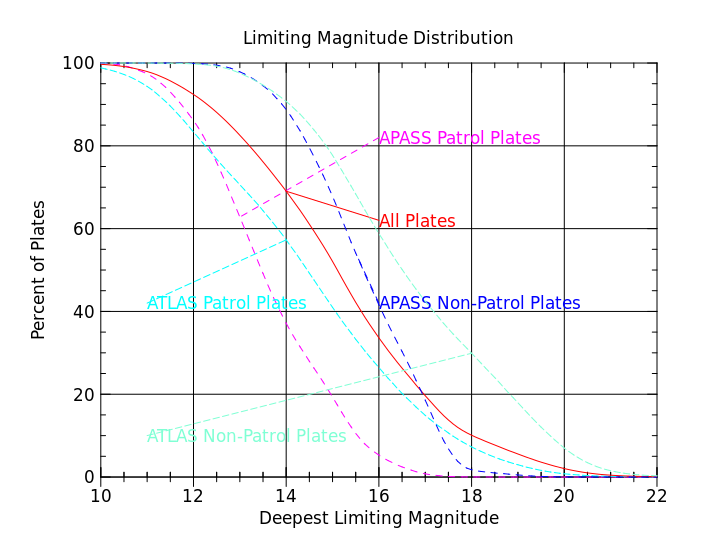 The middle plot on the left shows that the APASS calibrated dataset contains over 10,598,000,000 magnitude estimates with limited coverage deeper than 15th magnitude. 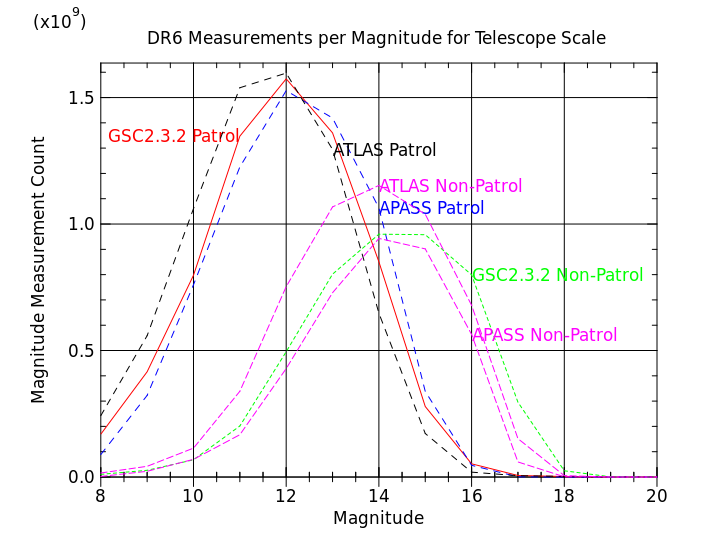 The release contains 44,233,000 lightcurves calibrated with the GSC2.3.2 catalog and 38,125,000 lightcurves calibrated with the APASS DR8 catalog. The third plot shows the median number of points for any given lightcurve as function of magnitude. This third plot is dominated by the patrol plate measurements. The GSC2.3.2 dataset may be divided into 7,697,000,000 images matched to the catalog and 1,795,000,000 unmatched images; the APASS DR8 dataset may be divided into 7,617,000,000 matched images and 1,460,000,000 unmatched images; and the Kepler Input Calibration dataset contains 262,066,000 matched images and 325,630,000 unmatched images. The unmatched images are mostly plate defects, astrometry matching errors, multiple exposure matching errors, and asteroids. The plots on the left use better quality matched images where the quality is described by a set of flags (see AFLAGS). 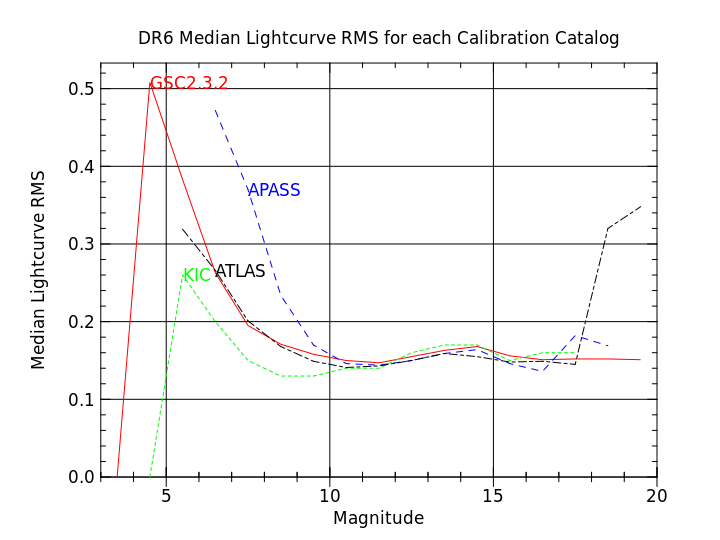 There must be at least 10 good quality points in a lightcurve to allow calculation of a reasonable lightcurve RMS. The leftmost plot assumes that the median lightcurve RMS removes variable stars. 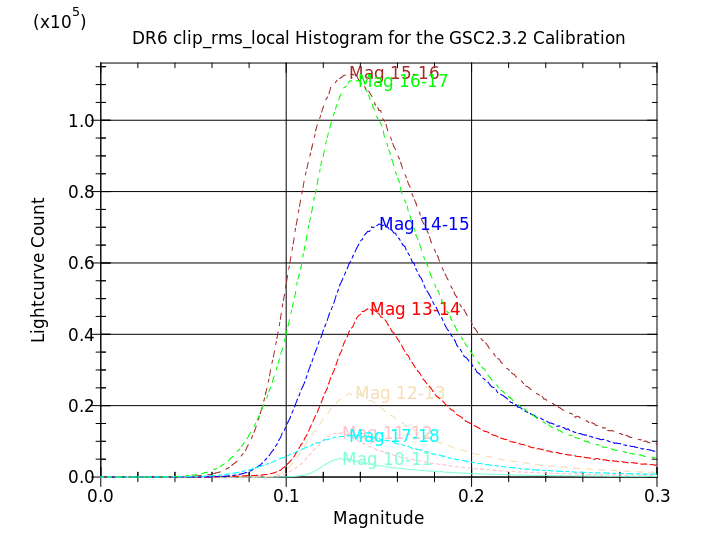 The detailed RMS histograms for each magnitude range appear in the plots on the right for each calibration catalog. The first plot on the left shows the deepest limiting magnitude per plate for the GSC2.3.2 and APASS DR8 calibrations. The second plot shows that the wide field patrol plates have a limiting magnitude of approximately 12 before circa 1935 and 14 after that date. Stars deeper than 16th magnitude have limited coverage from non-patrol plates after 1935. All limiting magnitude coverage plots below have a resolution of one degree. The red angular borders around the coverage area are artifacts of the plot shading algorithm. For each field, the GSC2.3.2 calibration catalog results appear on top, and the APASS DR8 catalog results appear on bottom. From left to right, the limiting magnitudes of the plots are 10, 12, 14, and 16. This field is centered on the North Galactic Pole and has a radius of 15 degrees. This field extends from galactic latitude +60 to +75. This field extends from galactic latitude +45 to +60. This field extends from galactic latitude +30 to +45. This field extends from galactic latitude +15 to +30. This field is the first scanned because of the availability of accurate photometric catalogs. This field is now part of DR4 and DR5. This field is the second scanned to investigate the usefulness of DASCH photometry for the study of quasars. This field is now part of DR2 and DR3. This field is the third scanned to study algorithms for nova searches and to test DASCH astrometry and photometry in crowded fields. 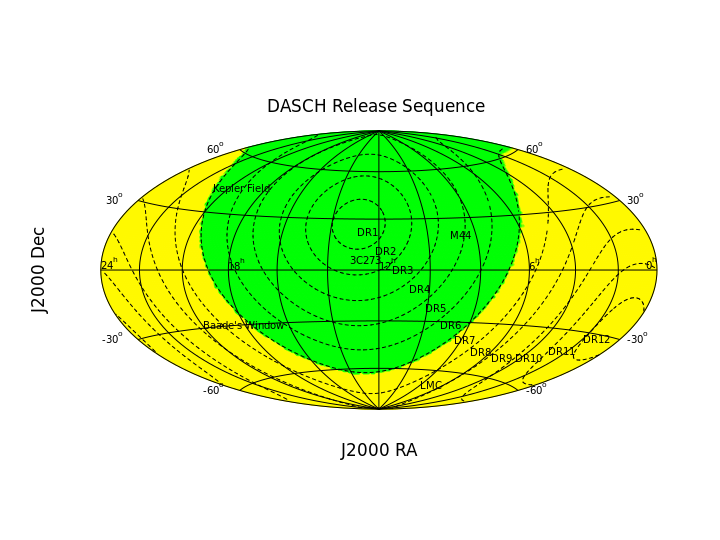 This field is the fourth scanned to take advantage of the superior accuracy of the Kepler Input Catalog over the GSC2.3.2 catalog for the calibration of DASCH plates. This field is now part of DR5 and DR6. Kepler Input Catalog calibrations are available for this field and its immediate surroundings above b = 0 degrees as shown below. Because of the historic discoveries made by Henrietta Leavitt, the LMC field provides the deepest magnitude coverage and highest plate density for the Harvard plates scanned to date. Improved photometry (for crowded fields) will be done for both the LMC and Baade's Window when these fields are re-processed for Production scanning.